Psalm 127 says, "Unless the Lord builds the house, the builders labor in vain." 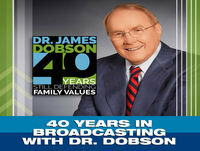 On this classic Family Talk broadcast, Dr. Dobson sits down with author and businessman Ken Eldred. Ken describes how his empty achievements in the corporate world caused him to seek out a relationship with Jesus. He also challenges those in business to evaluate how their work schedule impacts family life.